For those of you who are unfamiliar with what Sargasso is, it is basically seaweed that has washed ashore. The seaweed is caused by climate change and different wind patterns. The warmer the water, the more the seaweed spreads around the Caribbean. The Sargasso issues dated back to 2014 when one morning we woke up, took a walk to the beach and noticed all this seaweed that was clogging the shoreline on the beach. It started happening occasionally and then persisted quite regularly for the years to come. 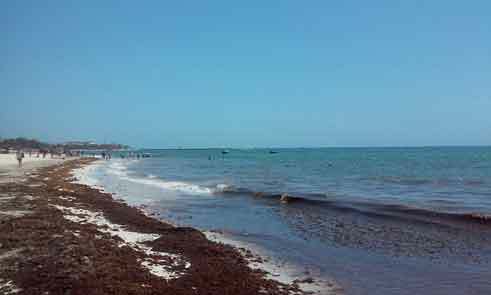 Playa del Carmen was not the only place that was hit with Sargasso, it was a popular issue throughout the Caribbean, as well as Florida and the Gulf of Mexico. Not only does the seaweed affect the beach area where many people like to walk; it also makes the turquoise sea- not look so blue. Vacationers don’t want to go to a beach that is covered in Sargasso and thankfully you don’t have to worry about that when vacationing in the Riviera Maya. As of this November 2018, most of our beaches are seaweed free. No need to worry about walking through a bunch of Sargasso in order to get into the water or checking webcams to see if the beaches have cleared up. Where does the Sargasso go? The workers in Playa del Carmen who are on beach duty both rake the seaweed and bury it under the sand, or they remove it from the beach area completely with a tractor. The tractor makes it easier to remove the seaweed and trash that is left behind. The workers here in Playa del Carmen work hard to ensure the beach is appealing for visitors and the locals here in the Riviera Maya. If at some point you get tired of visiting the beach, I would highly recommend checking out a cenote in the area. Sinkholes or cenotes are natural swimming holes that are great for snorkeling and diving or just a leisurely swim. You will see many different fish without having to go swimming. Whether you are looking for a more upbeat experience such as Mamitas Beach Club or a more relaxing, tranquil experience at Xpu-Ha or Tulum- you can’t go wrong with any beach in the Riviera Maya. Each beach is spacious and offers room for everyone. In terms of picturesque beaches, it is very hard to beat the atmosphere and color of the sea at Tulum. 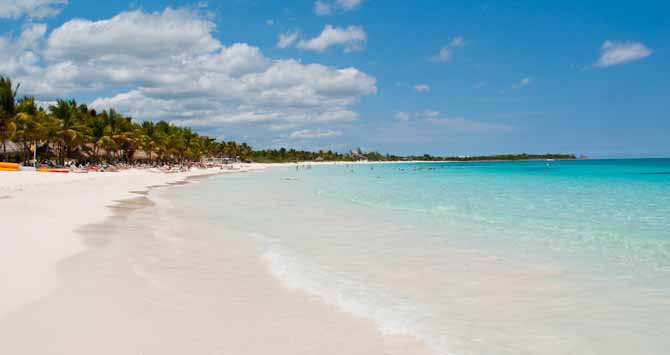 Tulum beach has been rated one of the top 10 beaches by many reputable websites and magazines in the past five years. With the Mayan Ruins located on the top of one section of the beach, this is a must-visit attraction. Many expats and visitors come to Tulum and never leave because of the serenity they feel when they visit. We look forward to welcoming you to the Riviera Maya and we hope you enjoy our Sargasso free beaches! This entry was posted in advantages of living in mexico, Buying in Mexico, Downtown Playa del Carmen, Fun facts, Playa del Carmen, Riviera Maya, Things to see and do in the Mayan Riviera, why live in Mexico and tagged Beach, Caribbean, Playa del Carmen, Sargasso by Judi Shaw. Bookmark the permalink.